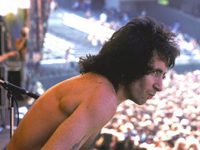 Bon Scott, lead singer and songwriter for AC/DC, died at age 33 from alcohol poisoning. On 19 February 1980, Bon Scott, who was only 33 at the time, passed out after a night of heavy drinking in a London club called MusicMachine (hosted at the Camden Palace, currently known as the KOKO). He was left to sleep in a car owned by an acquaintance named Alistair Kinnear, at 67 Overhill Road in East Dulwich, South London. The following afternoon, Kinnear found Scott lifeless, and alerted the authorities. Scott was rushed to King’s College Hospital in Camberwell, where he was pronounced dead on arrival. Although common folklore claims that ingestion of vomit or drugs were the cause of Scott’s death, the official cause was listed as “acute alcohol poisoning” and “death by misadventure.” Scott was cremated and his ashes were interred by his family in Fremantle, the area to which they had immigrated when he was a child. Inconsistencies in the official accounts of Scott’s death have been cited in conspiracy theories, which suggest that Scott died of a heroin overdose, or was killed by exhaust fumes redirected into the car, or that Kinnear did not exist. Additionally, Scott was asthmatic, and the temperature was below freezing on the morning of his death. Shortly after his death, AC/DC briefly considered quitting, but later felt that Scott would have wanted them to continue and hired Brian Johnson as the new vocalist. Angus Young stated in an interview with VH1 that Scott’s mother, whom all the band members personally knew, heartily approved of the band continuing, and felt that it was the only way to properly remember her son and their bandmate. Five months after Scott’s death, AC/DC recorded Back in Black as a tribute to him. Scott’s ashes were interred in Fremantle Cemetery and his grave site has become a cultural landmark; more than 27 years after Scott’s death, the National Trust of Australia has decreed his grave important enough to be included on the list of classified heritage places. It is reportedly the most visited grave in Australia. 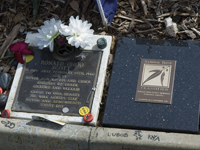 On 9 July 2006, the plaque was stolen from the site on what would have been his 60th birthday. AC/DC released a box set named Bonfire as a tribute to Scott on 18 November 1997. It contains four albums; a remastered version of Back in Black; an album with alternate takes, outtakes, and stray live cuts, Volts; and two live albums, Live from the Atlantic Studios and Let There Be Rock: The Movie. Live from the Atlantic Studios was recorded in 1978 at the Atlantic Studios in New York City. Let There Be Rock: The Movie was a double album recorded in 1979 at the Pavillon de Paris, and was the soundtrack of the motion picture, AC/DC: Let There Be Rock. AC/DC was inducted into the Rock and Roll Hall of Fame in 2003. Members of Scott’s family joined the band at the podium to accept the honour in his place. In the July 2004 issue of UK magazine Classic Rock, Scott was rated as number one in a list of the “100 Greatest Frontmen,” ahead of Freddie Mercury and Robert Plant. On 24 February 2008, a bronze statue of Bon Scott was unveiled in Perth, Western Australia. Bon Scott heritage listed grave site – Fremantle Cemetery Fremantle, Western Australia.